...for the animals, which we resemble and which would be our equals if we did not have reason, do not reflect upon the actions or the passions of their external or internal senses, and do not know what is color, odor or sound, or if there is any differences between these objects, to which they are moved rather than moving themselves there. This comes about by the force of the impression that the different objects make on their organs and on their senses, for they cannot discern if it is more appropriate to go and drink or eat or do something else, and they do not eat or drink or do anything else except when the presence of objects or the animal imagination [l'imagination brutalle], necessitates them and transports them to their objects, without their knowing what they do, whether good or bad; which would happen to us just as to them if we were destitute of reason, for they have no enlightenment except what they must have to take their nourishment and to serve us for the uses to which God has destined them. [Arguing the uniqueness of man by regarding animals to be merely automatons.]. Les Préludes de l'Harmonie Universelle (1634), 135-139. In Charles Coulston Gillespie (ed. ), Dictionary of Scientific Biography (1974), Vol. 9, 318. Enhydros is a variety of geode. The name comes from the water it contains. It is always round, smooth, and very white but will sway back and forth when moved. Inside it is a liquid just as in an egg, as Pliny, our Albertus, and others believed, and it may even drip water. Liquid bitumen, sometimes with a pleasant odor, is found enclosed in rock just as in a vase. As translated by Mark Chance Bandy and Jean A. Bandy from the first Latin Edition of 1546 in De Natura Fossilium: (Textbook of Mineralogy) (2004), 104. Originally published by Geological Society of America as a Special Paper (1955). There are other translations with different wording. I feel like a white granular mass of amorphous crystals—my formula appears to be isomeric with Spasmotoxin. My aurochloride precipitates into beautiful prismatic needles. My Platinochloride develops octohedron crystals,—with fine blue florescence. My physiological action is not indifferent. One millionth of a grain injected under the skin of a frog produced instantaneous death accompanied by an orange blossom odor. The heart stopped in systole. A base—L3H9NG4—offers analogous reaction to phosmotinigstic acid. In letter to George M. Gould (1889), collected in Elizabeth Bisland The Writings of Lafcadio Hearn (1922), Vol. 14, 89. I have always been very fond of mathematics—for one short period, I even toyed with the possibility of abandoning chemistry in its favour. I enjoyed immensely both its conceptual and formal beauties, and the precision and elegance of its relationships and transformations. Why then did I not succumb to its charms? … because by and large, mathematics lacks the sensuous elements which play so large a role in my attraction to chemistry.I love crystals, the beauty of their forms and formation; liquids, dormant, distilling, sloshing! The fumes, the odors—good or bad, the rainbow of colors; the gleaming vessels of every size, shape and purpose. In Arthur Clay Cope Address, Chicago (28 Aug 1973). In O. T. Benfey and P. J. T. Morris (eds. ), Robert Burns Woodward. Architect and Artist in the World of Molecules (2001), 427. I shall never forget my first encounter with gorillas. Sound preceded sight. Odor preceded sound in the form of an overwhelming, musky-barnyard, humanlike scent. 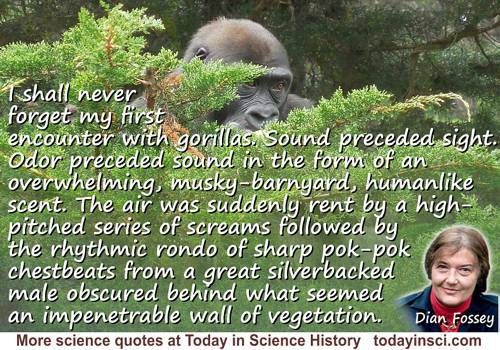 The air was suddenly rent by a high-pitched series of screams followed by the rhythmic rondo of sharp pok-pok chestbeats from a great silverbacked male obscured behind what seemed an impenetrable wall of vegetation. Mineral substances vary greatly in color, transparency, luster, brilliance, odor, taste, and other properties which are shown by their strength and weakness, shape, and form. They do not have the variety of origins that we find not only in living matter but also in original matter. Moreover they have not been classified like the latter on the basis of the place where they pass their life since mineral substances lack life and with rare exceptions are found only within the earth. They do not have the differences in characters and actions which nature has given to living things alone. Great differences are not the essential features of minerals as they are of living and original matter. De Natura Fossilium (1546), trans. M. C. and J. A. Bandy (1955), 1. Our contemporary culture, primed by population growth and driven by technology, has created problems of environmental degradation that directly affect all of our senses: noise, odors and toxins which bring physical pain and suffering, and ugliness, barrenness, and homogeneity of experience which bring emotional and psychological suffering and emptiness. In short, we are jeopardizing our human qualities by pursuing technology as an end rather than a means. Too often we have failed to ask two necessary questions: First, what human purpose will a given technology or development serve? Second, what human and environmental effects will it have? Report of the Subcommittee on Air and Water Pollution (7 Aug 1969). 'Environmental Quality: Summary and Discussion of Major Provisions', U.S. Environmental Protection Agency, Legal Compilation, (Jan 1973), Water, Vol. 3, 1365. EPA website. The act of smelling something, anything, is remarkably like the act of thinking. Immediately at the moment of perception, you can feel the mind going to work, sending the odor around from place to place, setting off complex repertories through the brain, polling one center after another for signs of recognition, for old memories and old connection. In Late Night Thoughts on Listening to Mahler's Ninth Symphony (1984), 42. What street they sailed from, by their sight and smell. Fall from the conduit prone to Holborn Bridge. Sweepings from butchers’ stalls, dung, guts, and blood. Dead cats, and turnip tops, come tumbling down the flood. Poem, 'A Description of a City Shower', first published in the Tatler, No. 238 (17 Oct 1710). Reprinted in Pope and Swift's Miscellanies in Prose and Verse (1711, 1721), 225-227. Swift wrote at the time in London that the street surface open gutters (kennels) were the primary means for handling stormwater flows and disposing of every kind of human and animal waste. “Devoted” means overwhelmed. Smithfield was a market with butchers' shops and cattle and sheep pens. St. Sepulchre refers to a church in Holborn. The Holborn Conduit was taken down in 1746. Below Holborn Bridge ran the Fleet Ditch (a stagnant remnant of the former Fleet River after its water supply had been diverted). It was joined by a stream called Snow Hill. Notes printed with the poem collected in Jay Parini, The Wadsworth Anthology Of Poetry (2005), 723-724. We divorced ourselves from the materials of the earth, the rock, the wood, the iron ore; we looked to new materials which were cooked in vats, long complex derivatives of urine which we called plastic. They had no odor of the living, ... their touch was alien to nature. ... [They proliferated] like the matastases of cancer cells. The Idol and the Octopus: political writings (1968), 83 and 118.